Guardiola and Mourinho have always had a difference in style. When Madrid had wrested a 1-1 draw at the Santiago Bernabéu in the first game of what has been touted to be an epic series, the groans burst from all corridors. After all, when you pin two teams who are the most acclaimed in world football on the basis of form and pedigree, you expect to see the most acclaimed football. But inevitably, accusations came flying of Mourinho having once again "sterilized" the game and removed the element of skill. Of course the impatient journalists decried it as a bore, and Barça fans stuck to their moral high-ground, lambasting Madrid for being unambitious and even guerrilla-like. Even Real club legend Alfredo Di Stéfano condemned Real saying, "Madrid are a side with no personality. They just run back and forth constantly, tiring themselves out. We saw clearly that their approach was not the right one. Barcelona were a lion, Madrid a mouse". But one felt that instead of blasting Madrid's players, Di Stéfano was actually using his honorary president title to scythe Mourinho, a coach who's philosophy is largely different from the one Di Stéfano played under with Puskás and Kopa all those years ago. Every since Mourinho has arrived at the Bernabéu, there has been backlash from the "romantics" in the game. He has shouldered a lot of unfounded blame by critics who have only chosen to focus on moments such as Madrid's 5-0 Clásico debacle. His reputation for defensive solidity has been shot back against him, when throughout the season he has fielded mouth-watering players like Ronaldo, di María, Özil, etc. Cruyff has taken upon himself, as he often does, to publicly scorn Mourinho as a "title-winning coach, but not a football coach." It's funny how all the lynchers disbanded after Real's monumental Copa victory. Of course Mourinho was no apologist after having been vindicated in his principles. "Thank you," he simply said. "I like being a coach who wins titles." The classic tale with Mourinho and his detractors played out once again. He had silenced them for a moment, but not won their hearts; without a doubt his critics will emerge once more should Madrid falter in the Champions League stages. As Mourinho has said before in the oft-repeated quote "Those who love me, follow me. Those who hate me, chase me", there is not much he can do to win over such stubborn crowds. It's more appropriate to describe him as a "title-winner, not a critic-winner", and I'm certain that is a description he would most savor. But the truth is there are only a few people in the media and in football who understand Mourinho's tactics (if one can lump them all in such a large motley box). Mostly you will hear the same buzz-words bandied about: "defensive", "constricting", "anti-football". They're words which are hardly descriptive, if not outright misleading. Only a few in the football have given Mourinho the analysis and respect he deserves: Sid Lowe and Michael Cox being the first to come to this writer's mind. The truth is that 1-0 perfomance with which Mourinho silenced his critics was not all that different from the 1-1 demonstration. In fact, Mourinho only built on the same tactics he had experimented with in the draw at the Bernabéu in the Copa win. In the draw, Mourinho was blasted for placing Pepe in the midfield as a sort of "spoiler", when Pepe actually proved to be composed on the ball and adept at tracking the deep runs of Messi. That's quite far from the description of him being a pure hacker to remove Messi from the game. Also in the draw, Madrid were accused of lacking attacking intent, when Madrid had equaled Barça's shots on goal with a third of the amount of possession. Most observers decided that the superiority was Barça's, as they had quite easily secured their third consecutive league title, but Mourinho took the result as a positive knowing that this opening salvo had revealed just enough of a weakness in his opponent to exploit. And sure enough, in the Copa Del Rey Mourinho only enhanced his earlier tactics. He pushed Pepe even higher up the pitch, and moved Xabi Alonso deeper. It seems odd to play a "defensive" player higher upfield while moving an "offensive" player deeper, but this allowed Pepe to win possession higher up the pitch; and Alonso was more free to distribute, establish counter-attacks, and control the tempo of the match. Mourinho also took attacking players and inserted them outside of their natural positions. The success of this was apparent as Ronaldo headed home from a center forward position over a helpless Adriano, but at the same this rearrangement in attack naturally made his players a bit more rigid by tweaking the fluidity they have in their natural positions. More importantly this tactic helped Madrid maintain their shape, and it puzzled the Barça defense who had to deal with players in positions they weren't comfortable with all night long. Özil was a particular nightmare in the wing, constantly making use of long balls driven behind Barça's attacking fullbacks. In a sense, these are some of the same tactics that Mourinho has used in Inter, where he placed Eto'o a proven goalscorer on the wing, and one must remember that Inter stunned the world by knocking Barça out of the cup. That is not to say that Barça aren't as adaptable as Mourinho's teams. Guardiola is as much a tactical genius as Mourinho although in a completely different sense. In moving Messi to the middle in the last two seasons, he's helped the team unlock countless defenses by pulling the oppositions centrebacks out of postion. By moving Busquets to a sweeper role, he's given the fullbacks and the entire team even more attacking thrust than before. But for all of that, you do have to question his prudence at times. It was apparent Barça were playing a dangerous game in the Copa final whenever Piqué roamed out of the back, leaving Mascherano of all vertically-challenged people as sole protection; and Guardiola has been stubborn in choice of forwards with Messi, Villa, and Pedro all being physically the same sort of player. But most of all one worries about the lack of options Guardiola has now with Puyol, Abidal, and Bojan injured, and the thought that as fluid and versatile Barça are, they can't match the many variations which Mourinho has in store. As natural as we say the linkups between Barça's attacking players are, there is a risk that it gears them to only playing one kind of football. Certainly it would not be the first time in history that a brilliant attacking team has been undone by another team's more solid, structured approach, especially one which the attackers are not accustomed with. It happened to the Dutch teams in '74 and '78, to Zico's Brazil in '82, and even the Mighty Magyars fell to it back in '54. It's a theme which has resonated throughout history, politics, love and war, but perhaps it has never been better understood than in the odd obsessions which all men carry like football, racehorses, and chess. "Let us say the game may be continued in two ways: one of them is a beautiful tactical blow that gives rise to variations that don't yield to precise calculation; the other is clear positional pressure that leads to an endgame with microscopic chances of victory... I would choose the latter without thinking twice. If the opponent offers keen play I don't object; but in such cases I get less satisfaction, even if I win, than from a game conducted according to all the rules of strategy with its ruthless logic." 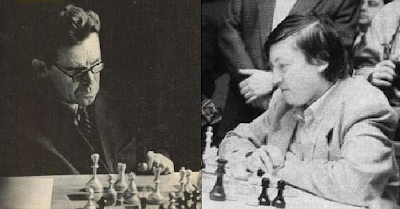 We have also seen the likes of Nezhmetdinov, "a tactical genius who had a plus score against none other than Mikhail Tal (possibly the most attack oriented and exciting world champion of them all), [who's] victories were frequently incredible but he lacked the support to reach the summit of the chess world." Perhaps Guardiola and Mourinho are not quite so comparable to these legends of a wholly separate field, but in the final two games between them you can't help but feel that much deeper questions will be answered aside from which team is better. Nezmethdinov, on the left, and Karpov, on the right, never played each other, but we might get a sense of the outcome which never came in Barça and Madrid's clashes.